How to avoid pitfalls, when implementing CCPM. Insights from the New Maslow Pyramid. The answer is in New Maslow Pyramid. It is all about unfulfilled needs. Just like the Classic Maslow Pyramid, the New Maslow Pyramid, is about basic needs. The difference is that the Classic Maslow is about people. New Maslow is about (project) organizations. You’ve got to know that most problems with projects caused by unfulfilled needs. Lack of people, lack of time. Poor communication, poor collaboration. And absence of adequate plans. These are needs low in the Pyramid. 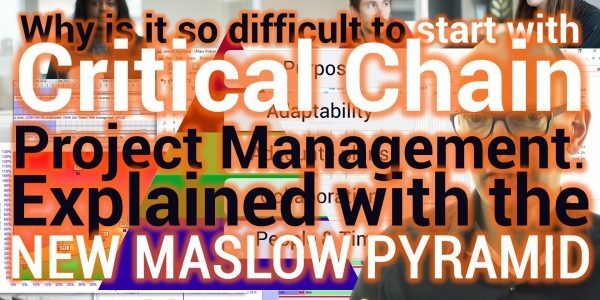 Most appealing tools of the CCPM toolbox are for issues in the top layers of the Pyramid. In contrast, the tools Agile is known for, help to fulfill the basic needs. That answers it is so difficult to implement Critical Chain Project Management. And why Agile is so popular. The pitfall for CCPM is to jumpstart without having adequate plans. Good old traditional project management is perfect for that. The pitfall for Agile is to apply it to organizational challenges that are either too complex or too big. Both CCPM and Agile have their specific application where one is better than the other.